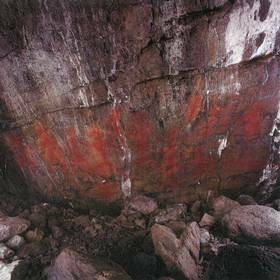 For just over 100 years ago, the first cave paintings in Northern Europe were discovered on the Saga Island of Leka in Nord-Trøndelag County. On May 3rd 1912, three young men found the sensational paintings located deep inside the Solsemhula (English: The Solsem Cave). Solsemhula is 131 feet (40 m) long, 20 feet (6 m) wide and about 26 feet (8 m) high. It is divided into three ‘sections’ and is located 256 feet (78 m) above sea level on the south-west side of Leka. In the innermost part of the cave the walls are covered with red paintings of people dancing: 6-7 people on the western wall and 14 on the eastern. In addition, a crucifix is painted next to the dancers. The human figures measures about 0.9 – 3.3 feet (30-100 cm). Archaeologists are very uncertain about their age, but assume that they were made in the late Stone Age or early Bronze Age. The findings include approx. 2000 bones from fish, seabirds, seals, goats, cows and horses, in addition to human bones – both adults and infants. Several bone tools, a bird shaped bone figure depicting the now extinct Great Auk, and an arrowhead made of slate has also been found inside the cave. Test results indicate that the cave was inhabited from ca. 1700 BC to 200 BC. 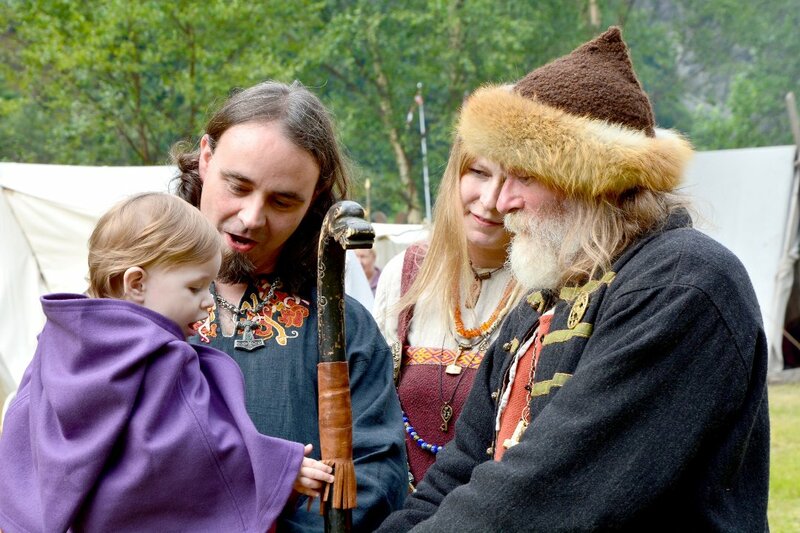 – Solsemhula has taught us a lot about our history. The cave paintings are beautiful, and the other objects may indicate that rituals and sacrifices have been performed here, says curator at the Norwegian Institute for Cultural Heritage Research Terje Norsted. Not all questions have yet been answered, but it has been established several possible theories. The archaeologist, who first examined the cave in 1912 and 1913, found that this was an ancient settlement. Later, other archaeologists developed the theory that the cave was used as a place for rituals and sacrifices. Nord-Trøndelag County is responsible for managing the monument at Solsem, while Leka Municipality is responsible for the preservation. The cave used to offer free access, but in recent years it is only accessible through guided tours during the summer season. Previously, Solsemhula used to be lit but the light creates algae that are harmful to the paint. Humidity is also a problem, including people touching the fragile paint. 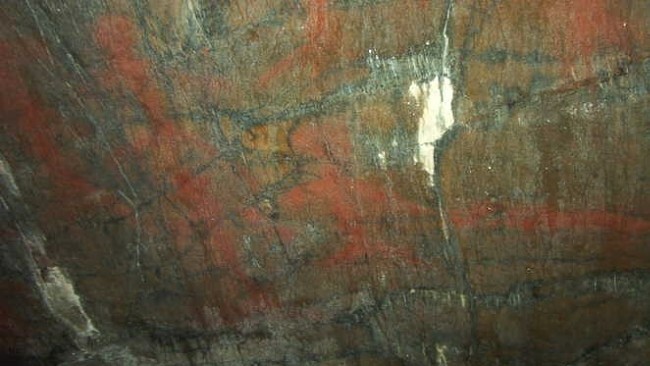 For over 50 years, Solsemhula was the only known cave with paintings in Norway. Later, 10 other caves were found in the area between Leka in the south to Lofoten in the north. Among them is the famous Fingalhula in Nærøy Municipality, which has the largest collection of cave paintings in Norway. However, the cultural monument at Leka is well known among archaeologists and scientists, and there are still several alternative interpretations of the drawings. The people have their knees bent and are in motion – heading deeper into the cave. Experts believe that they are on their way towards the underground. On the other hand, it can also be a dance ritual or a ceremonial parade. The people are carrying objects, either club or spear, and they wear some kind of head gear. In other words, there are many theories surrounding the mysterious carvings in Solsemhula on the Saga Island of Leka. Is the ‘Fingal’ of Fingalhula in any way connected to the Fingal of Fingal’s Cave in the Hebrides off Scotland (made famous by Felix Mendelssohn’s music)? Hm, I need to check that out. I have never heard of any connection, but I will ask archaeologists working with caves.